Finally, a Paleo Protein Powder that Delivers! I think it’s pretty well known that the best way to ensure stable blood sugar levels through the first half of your day it to have a protein based breakfast. But, how many of us actually like the taste and texture of our protein mix? I used to dread my protein boost in the morning because it was so hard for me to choke down. Not anymore!! After 20+ years of hunting for a protein powder that not only delivers a good punch of protein without carbs and sugars, I’ve finally found it!! If you are you tired of the gritty and unappetizing texture of most protein powders, then this is a MUST TRY. When you blend it with your liquid of choice and a few ice cubes it has the taste and consistency of a MILK SHAKE!!!! Start your day with our Paleo Protein Powder to jump start your metabolism in the morning, curb sugar cravings, and assist with fat loss. I also use this protein as a pre-workout boost to keep my energy up during my work-outs. Protein shakes make the perfect plan for fast, lasting fat loss. They’re quick and convenient. Blend a protein shake with unsweetened coconut milk, frozen raspberries, avocado, kale, and freshly ground flax seeds, and it becomes incredibly nutrient-rich and, well, I’m not going to say tastes like a milkshake, but pretty darn delicious. One study in The American Journal of Clinical Nutrition found a protein-rich breakfast keeps hunger at bay far better than a carbohydrate-heavy breakfast, thanks to protein-suppressing gastric emptying and your hunger hormone ghrelin. A later study in that journal concluded a protein-rich breakfast could improve satiety, reduce snacking, and improve diet quality in overweight or obese teenage girls. If time or lack of appetite mean you don’t get the protein-rich breakfast your body demands, protein shakes can step in to efficiently complete that job in just minutes. Studies show protein shakes can keep you lean and healthy. One meta-analysis in the International Journal of Obesity and Metabolic Disorders found one or two vitamin/ mineral-fortified meal replacements could “safely and effectively produce significant sustainable weight loss and improve weight-related risk factors of disease.” Yet among a growing array of choices, finding the right protein shake can become a challenge. If you don’t believe me, visit your local supermarket or health food store and read those labels. Confusing, right? Let me simplify your search. Your powder should contain 20 – 25 grams of protein per serving. If you’re very athletic, have significant weight to lose, or recovering from surgery or injury, you may need to increase your protein intake 10-20 percent. Choose a high-quality protein base: plant-based powder made from rice, pea, chia, chlorella, or cranberry protein, or a blend of these. If you opt for de-fatted beef protein, look for GMO-free and hormone-free (meaning no recombinant bovine growth hormone, or rGBH). I say “no way” to whey for two reasons. Whey absorbs very quickly, making it great post-workout (if you’re not dairy sensitive) but terrible as a satiating meal replacement powder. One study in the journal Nutrition & Metabolism found whey protein can create an insulinogenic effect similar to white bread. In other words, whey protein can elevate blood sugar (and subsequently, insulin) levels similarly to a high-carbohydrate food like bread. I’m also not a soy protein fan, as soy can create food intolerances, especially when you use it every day. And, for those with thyroid conditions, too much soy is a big no, no. Casein protein has been fingered in creating allergic reactions to dairy-another no-go. A study in The Proceedings of the Nutrition Society found casein peptides behave very similarly to gluten: They can react with opiate receptors in the brain, thus mimicking the effects of opiate drugs like heroin and morphine. Pay attention to other ingredients besides protein. Manufacturers make powders palatable and pretty with preservatives, bulking agents like maltodextrin (corn), and sweeteners such as aspartame and sucralose. If the container lists these or anything you can’t pronounce, put it back. If you opt for a sweetened powder, look for one with no fructose or high-fructose corn syrup and no more than five grams of sugar per serving. Even better are natural alternative sweeteners like stevia and monk fruit. Especially if you use protein powder as a meal replacement, look for one that mimics nutrients you get in a healthy meal, including vitamins, minerals, antioxidants, enzymes, and at least five grams of fiber per serving. 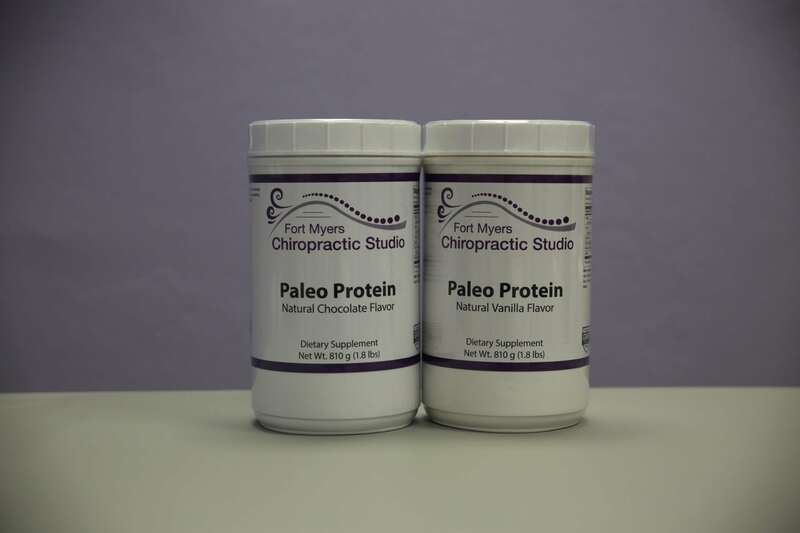 The Protein Powder I offer my patients is Paleo, so it is gluten free, soy free, dairy free and sugar free and contains no artificial colors or fillers. At only 140 calories, 20 grams of protein and only 1 gram of sugar per serving, it is the perfect pre or post-workout protein supplement. I have one every day for breakfast. Choose Chocolate or Vanilla, a 30 serving container is $72.08 including sales tax. So, if you are you tired of the gritty and unappetizing texture of most protein powders, then this is a MUST TRY. When you blend it with your liquid of choice and a few ice cubes it has the taste and consistency of a MILK SHAKE!!! !